When working with budget carbs, you rarely get innovation or upscale features. The features included with the Quick Fuel Slayer 750 make it that much more attractive because not only do you get an electric choke (the only others were the Q-jet and the Summit carb), but you also get screw-in idle and high-speed bleeds for tuning and a very simple, adjustable vacuum secondary (arrow). Wait, there’s more. The Slayer also has a custom secondary metering plate employing Holley jets, making secondary jetting even easier and less expensive. Adding credibility, the Slayer won the out-of-the-box horsepower contest and was also the leanest at cruise rpm. We think at least one reason for this carb’s excellent performance is the drop-leg boosters that are normally found only on more expensive Holley-style carburetors. All told, we were very impressed with the Slayer’s performance. The first test for each carb was simply measuring peak horsepower right out of the box with only an idle mixture adjustment. This test should not be used as the sole indicator of performance for several reasons. First, this test is really only valid for this engine. A big-block Ford, for example, could and probably would produce different rankings. More importantly, the top three carbs are separated by a mere 4 hp, which is literally 1 percent. It would be nearly impossible to feel that in the car. We did, however, simulate the difference in quarter-mile times using the power difference between the Slayer and the Holley 3310C, which was worth about 0.25-second and 2.5 mph. Nearly all of the e.t. difference is not in the peak power but rather in the Slayer’s significant torque improvements in the midrange over all the other carburetors. Again, these were out-of-the-box comparisons. Later tests show average power numbers after tuning. 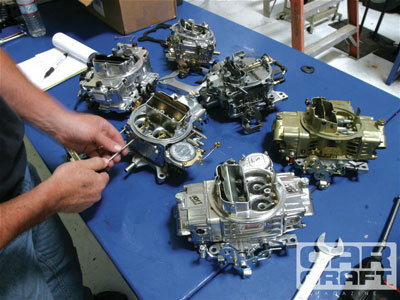 Note that the swap meet carb performed poorly and placed last in this test because the secondaries barely opened, causing the 40-plus-horsepower difference between it and the Quick Fuel Slayer carburetor.